2015 was a year that had some magical bowling spells that gave teams resounding victories. Stuart Broad's eight-wicket haul during the Ashes series gave England a famous win against their bitter foes, Australia. 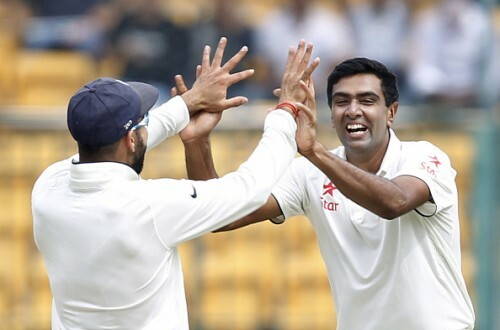 Ravichandran Ashwin tormented South African batsmen in the Proteas’ tour of India and ended the year as the best Test bowler. Josh Hazlewood, who was named the ICC Emerging Player of the Year had a fabulous year with the ball, picking up more than 50 wickets in the calendar year. Ashwin and Broad were the other bowlers who picked up more than 50 wickets in 2015. Fellow Australian, off-spinner Nathan Lyon also had a great year as he continues as a world-class spinner picking up wickets on Australian pitches that don't always assist spin. Mitchell Starc was able to find form with the red ball in 2015 as he put in some match-winning performances in the year that included even touching the 160 kph mark. England all-rounder, Moeen Ali was regularly used a frontline spinner and responded brilliantly to his captain and picked up crucial wickets. Despite missing a few Tests due to injury, James Anderson was in great form as he reached the 400-wicket mark in the calendar year. Pakistan leg-spinner, Yasir Shah was another bowler who had an excellent year with the ball ending up fourth in the list despite playing the least number of Tests of all players in the top 10. Sri Lankan bowling pair, pace bowler Dhammika Prasad and spinner Rangana Herath were vital for the successes of the Lankan team in the longest format of the game. The list contains three Australians and three Englishmen while there are no bowlers from the No. 1 ranked Test team, South Africa. That probably summarises how bad the Proteas have fared in the longer format of the game. Their spearhead bowler, Dale Steyn played only five Tests throughout the year.